With the recent news about water crises and the depletion of natural resources it is clear that sanitation will be valued for years to come. The application of automation features, once limited to the industrial environment, makes the process of purification and the distribution of water, as well as the collection and treatment of sewage, much more efficient with much smaller losses. NOVUS is able to support its customers to ensure the full potential of the automation features are applied in order to allow more intelligent processes in sanitation. The automation of water and effluent treatment processes using PLCs and supervisory systems optimizes chemical dosing systems and increases efficiency. Records of the process variations allow studies and continuous improvement to be made. Other benefits are: ? Significant increases in the water quality produced; ? Greater plant availability resulting in increased production; ? Decreases in the variations of controlled parameters such as turbidity, color and chemical concentration; ? Improved loss ratio due to a reduction of errors in the treatment process; ? Economized use of chemical products by correcting and adjusting the dosage; ? Automated operation of workstations without the permanent presence of the operator; ? 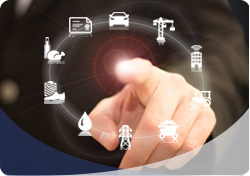 Monitoring and remote control of the process through internet, mobile or corporate networks; ? Process traceability with continuous historical records. Utilizing radio equipment or the mobile phone network, field transducers can be monitored remotely from an OCC (Operational Control Center) or on an Internet server Pressure, level, flow and all other important information can be displayed and monitored. ? Variables can be monitored continuously from a central server (NOVUS or own); ? Field equipment can store data locally and provide it when needed; ? Control routines (activating pumps and valves) can be operated locally without input from the central server ensuring operation even through a loss of communication. • Significant improvements in response times for incidents, as the onsite automation passes all the present and historical information to the server or OCC. Integrating NOVUS Drive frequency inverters with the family XL controllers, we have an application dedicated to controlling pump houses. This type of application usually requires the control of temperature and water pressure. Besides the automation of the pumps (that send water to the process), the automation of water cooling and / or heating auxiliaries is also supplied. All devices are connected in digital communication networks, thus bringing process information, consumer information, aiding the function of monitoring the entire system, as well as programming correct predictive and preventive maintenance of equipment. • Generating auditable reports with comparable data on energy-saving gains, inputs, payback, and other analyses that are commonly requested in this application.